Published on Friday, November 23, 2018. This article appears in the October/November 2018 issue of American Craft Magazine. I Am Not Angry, 2012, stoneware, porcelain, luster, 12 x 9 x 9 in. Ahrong Kim laughs when she recalls her first contact with clay. “I didn’t want to touch the clay – it was like touching mud. I didn’t like it at all,” says Kim, 32. She had gone to art school in her homeland of South Korea to study fashion design but quickly lost interest. To graduate, however, she had to learn every available ceramic technique. 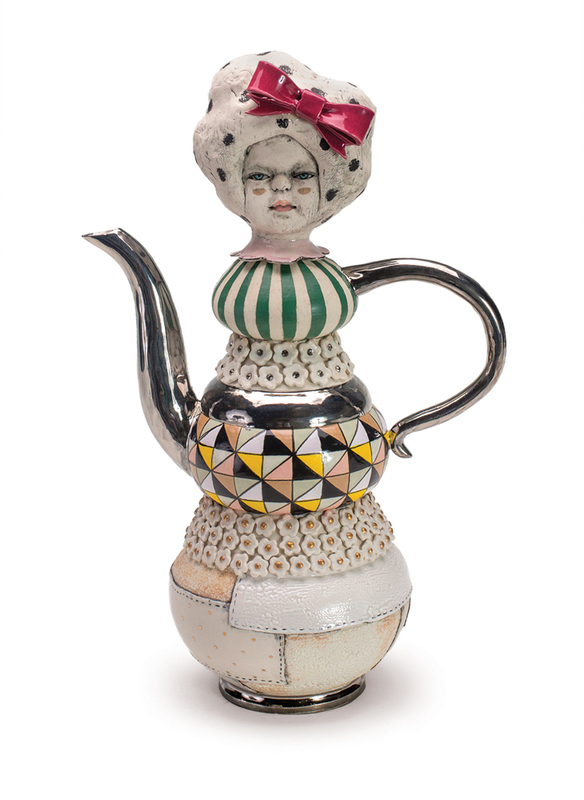 Face (Dots) Teapot, 2016, porcelain, glaze, luster, stone, 11 x 9 x 4.5 in. 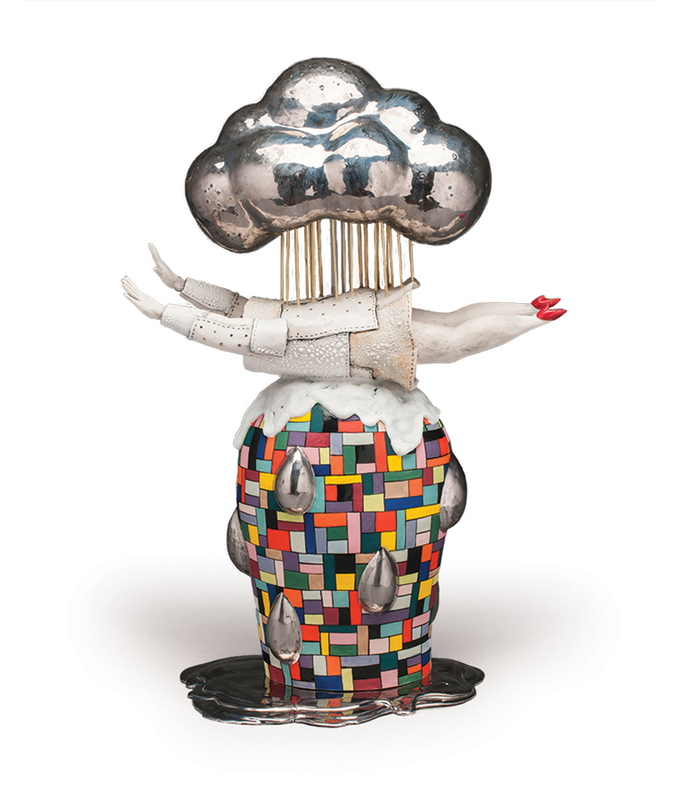 It’s Raining, 2017, stoneware, porcelain, luster, metal, glass, 16 x 10.5 x 5 in. Wonderland Fountain, 2017, stoneware, porcelain, luster, resin, 16 x 10 x 9 in. That patchwork style, called jogakbo, uses scraps of leftover fabrics to create cloth. It’s recognizable in the sculptural work Kim makes, where the mosaics of colorful squares and rectangles might serve as a centerpiece, backdrop, or accent to the evocative worlds she creates with clay. Kim calls her more figurative work “an emotional diary,” serving a need that started when she moved to the United States in 2011 to attend graduate school at Rhode Island School of Design. “I was so excited to go to RISD, but when I got there, it wasn’t fun at all,” she says. “I had so many things to do, and the critiques were really difficult because my English wasn’t good. I wasn’t able to express myself about what I was making, and I was really frustrated. I cried a lot.” She began to channel her emotions into her sculptures, with titles such as Sadness Implosion, Untitled (I Think Everybody Hates Me), and I Am Not Angry. Since Kim earned her MFA from RISD in 2013, her career has taken off, with a long list of awards, residencies, and high-end craft shows. 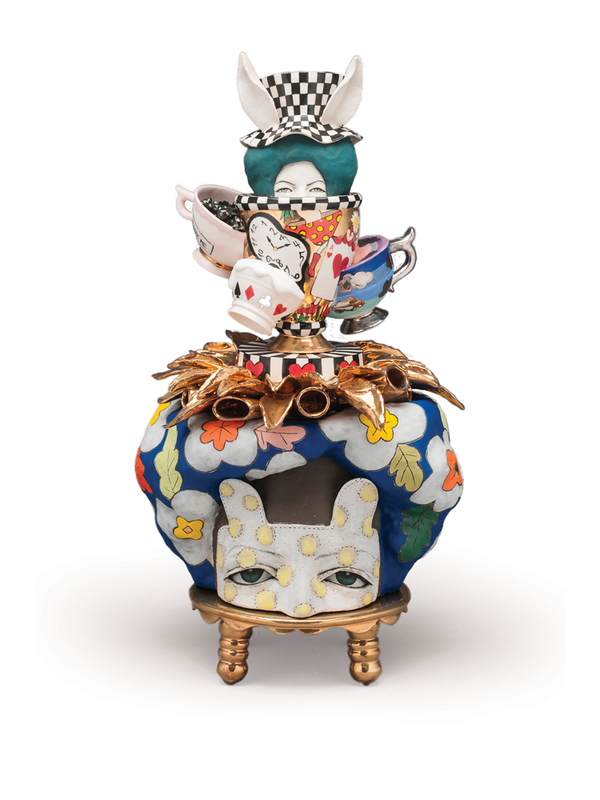 For the latter, she makes a line of teapots and mugs, merging function and sculpture. In August, she completed a five-year residency at the Clay Studio in Philadelphia, which she credits for opening many professional doors, and she recently relocated to Brooklyn.